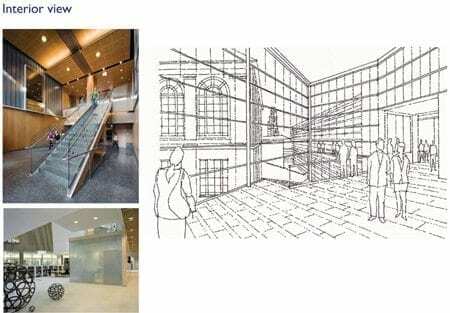 • Bohlin Cywinski Jackson (BCJ), Wilkes-Barre / Pittsburgh, PA.
• ZGF Architects, Portland, OR. 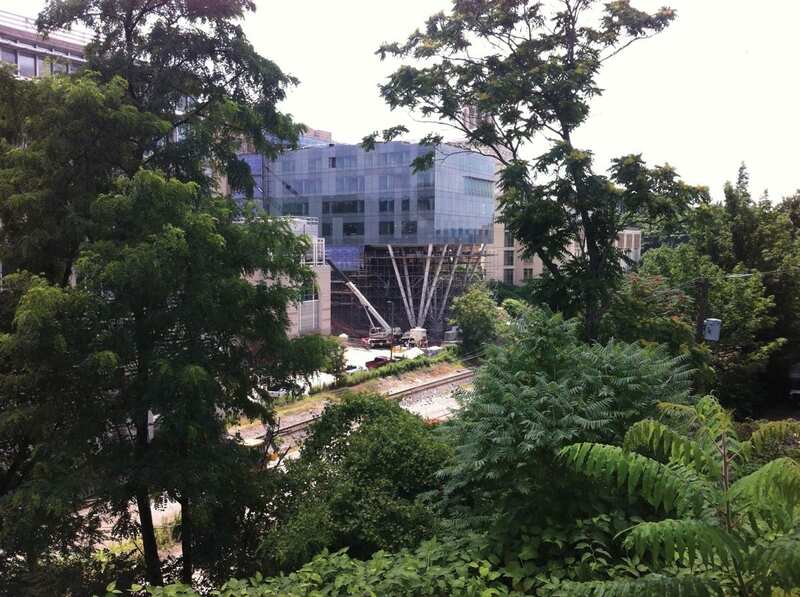 and Washington, DC. 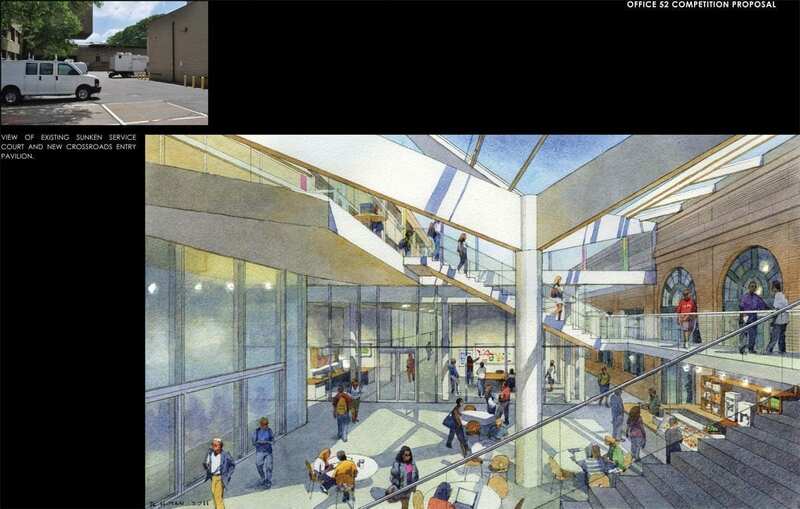 • OFFICE 52, Portland, OR. 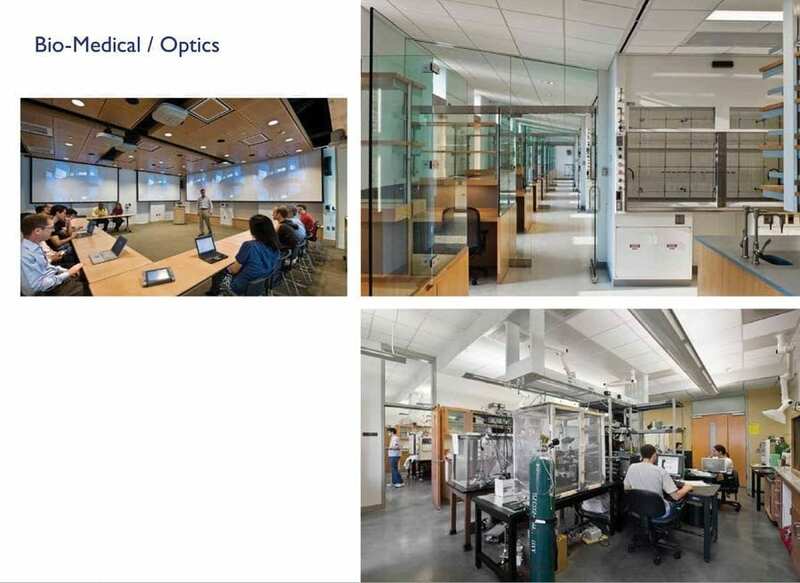 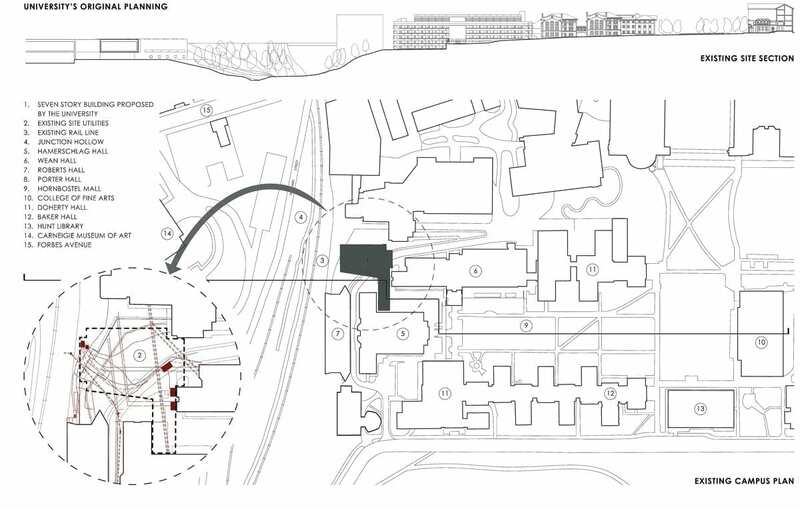 According to the campus master plan, the new building was to be located adjacent to three existing classroom and laboratory buildings, Hamerschlag Hall, Wean Hall and Roberts Engineering Hall. 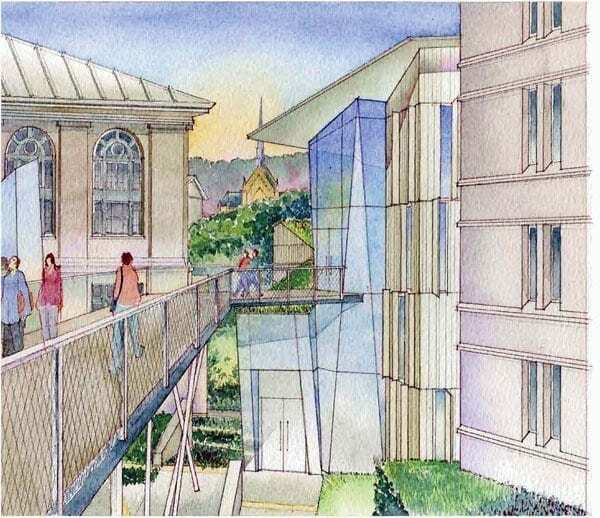 This decision was based upon the need to place Scott Hall’s shared research facilities in close proximity to the other faculty and facilities in the neighboring buildings. 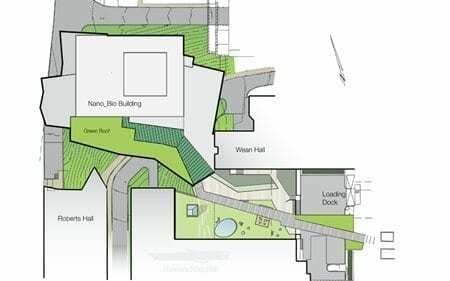 The site was directly to the west of Wean Hall, and separated from Hamerschlag Hall by a sunken service courtyard that unceremoniously terminated the west end of the Hornbostel Mall, one of two major green spaces on campus. 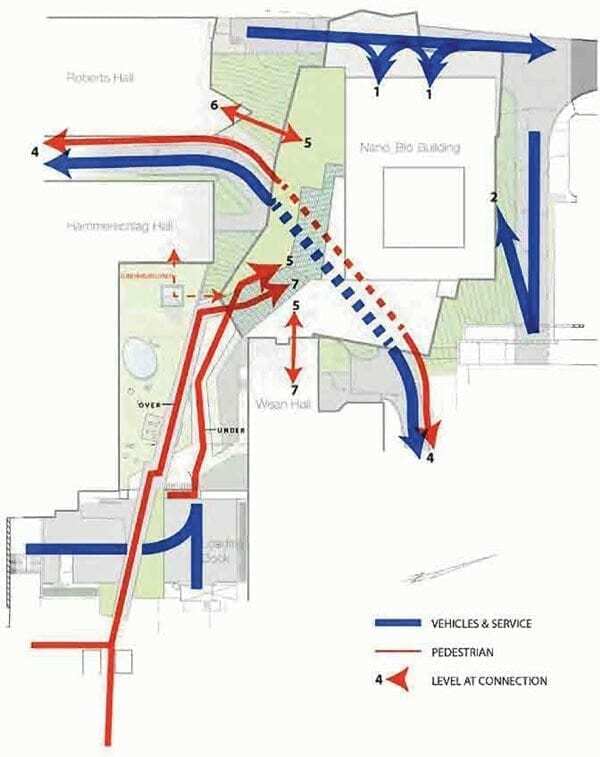 In addition the site was bisected by an existing service road, and dropped almost 100 feet into Junction Hollow at its western edge. 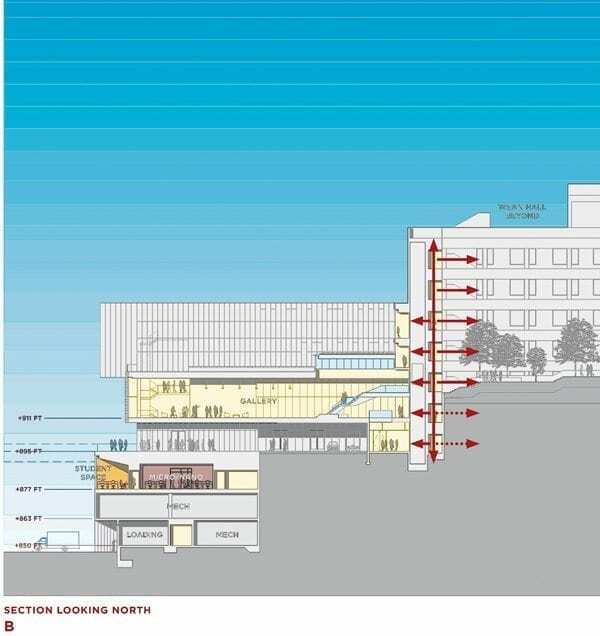 To accommodate the anticipated programs—including a ‘clean room’ for nano- scale research—the University’s planning approach envisioned a new 78,000 SF, seven-level structure that spanned the service road and descended into Junction Hollow. 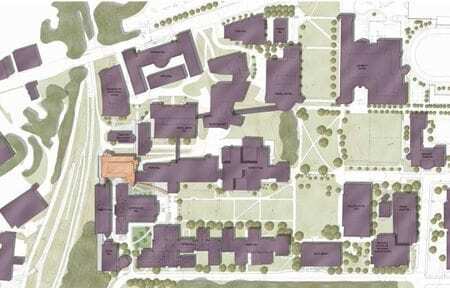 For orientation purposes, the budget target for project construction was set by CMU at approximately $600 SF. 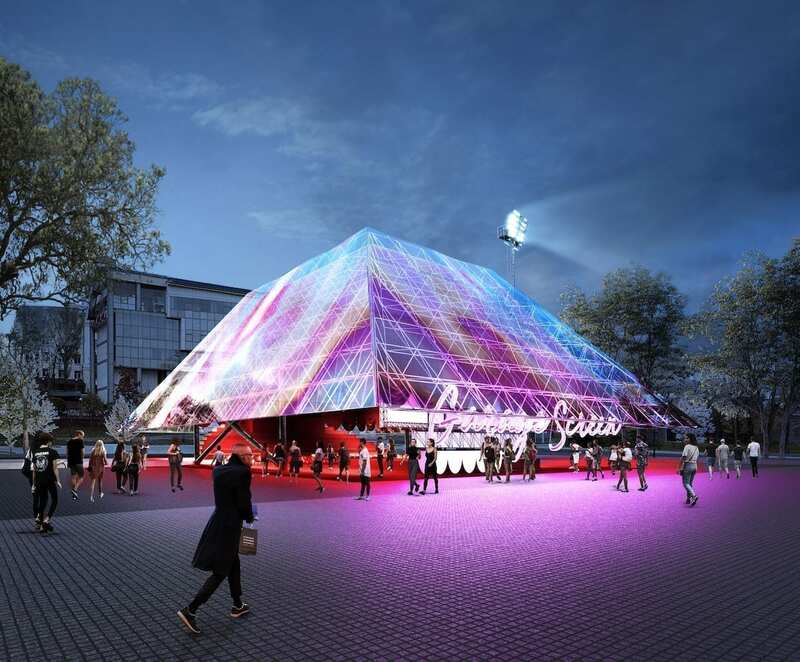 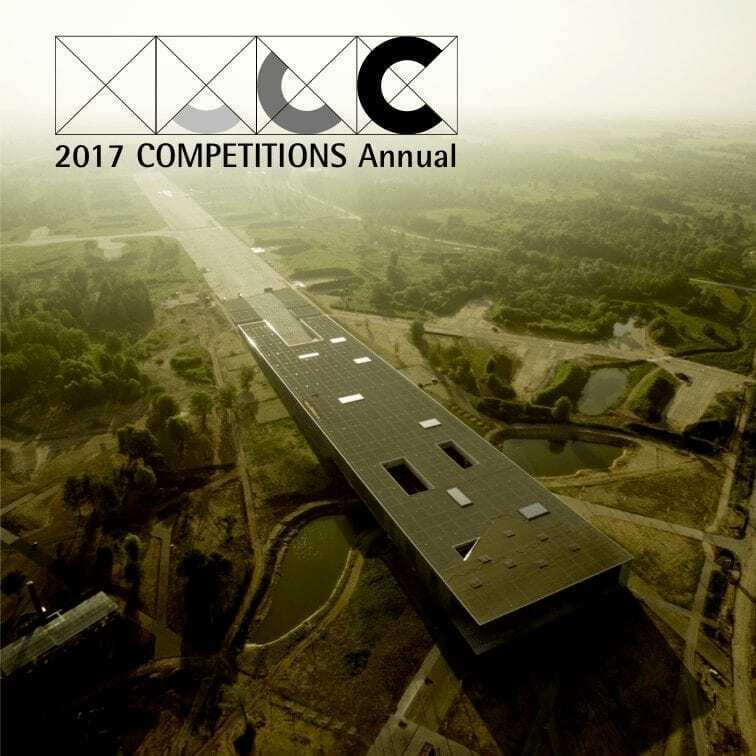 To cover the design costs for the competitors, the four participating firms were guaranteed a stipend of $40,000 each. 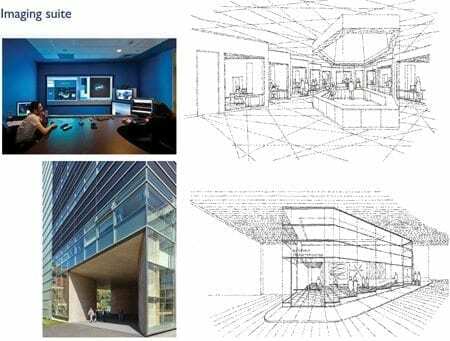 Among the four firms participating in the competition, OFFICE 52 from Portland, with less than ten employees, was the only relatively small firm included. 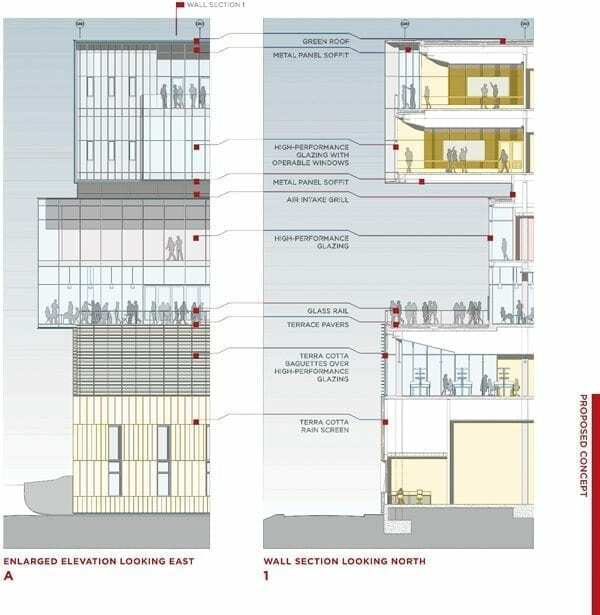 All of the other firms could be characterized as ‘big hitters,’ most having multiple offices scattered around the country. 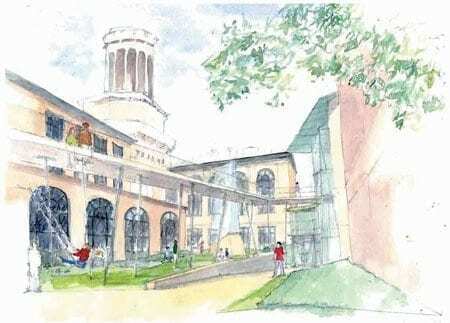 Although OFFICE 52’s changes did not follow the campus plan, their innovative approach found favor with the University. 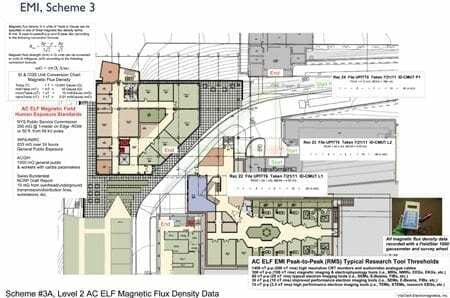 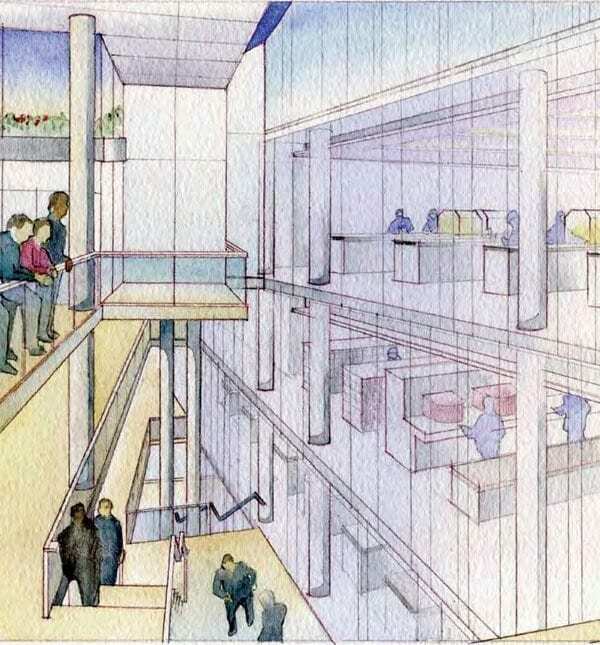 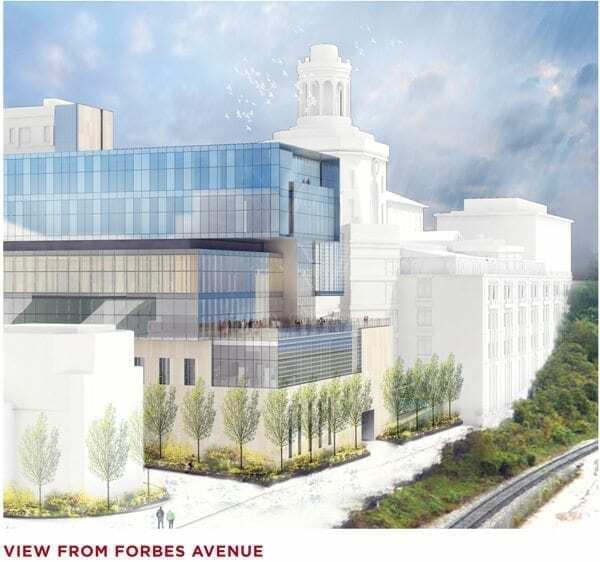 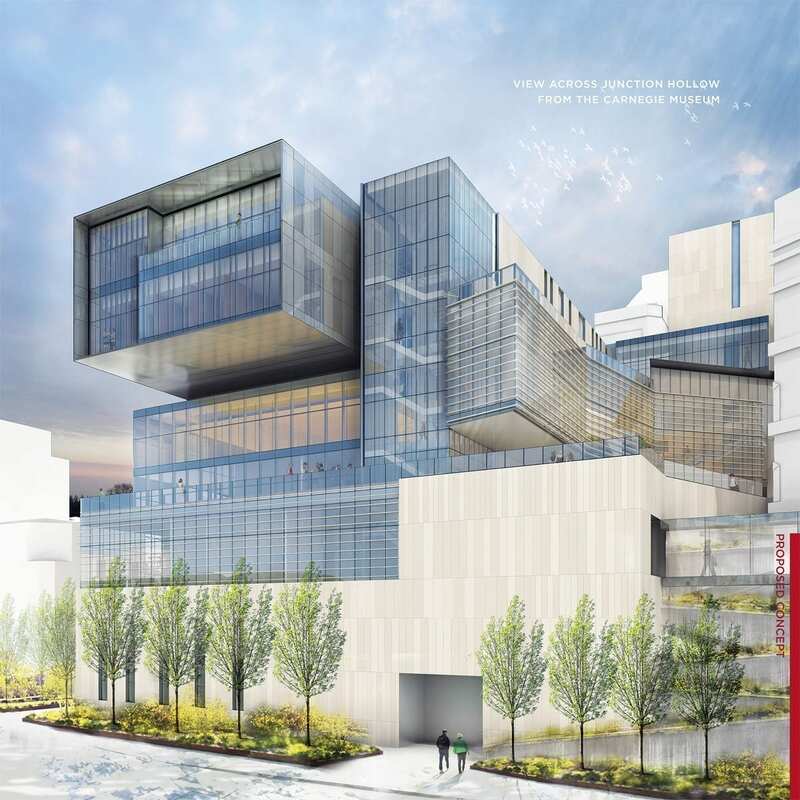 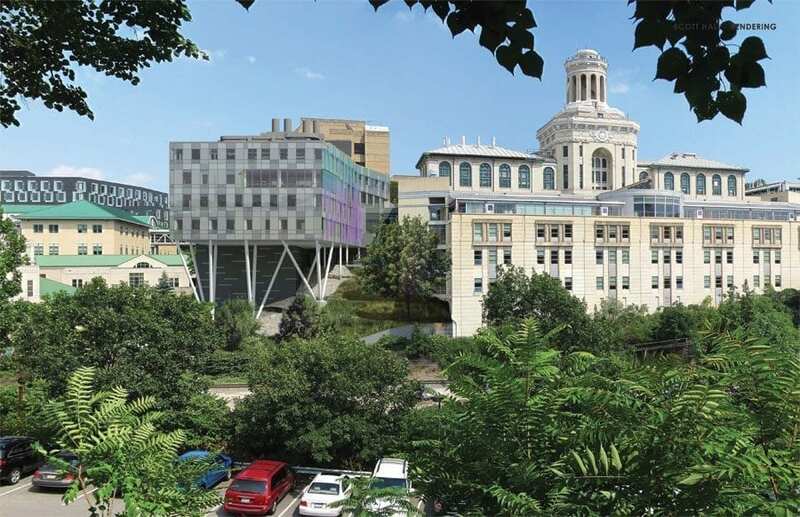 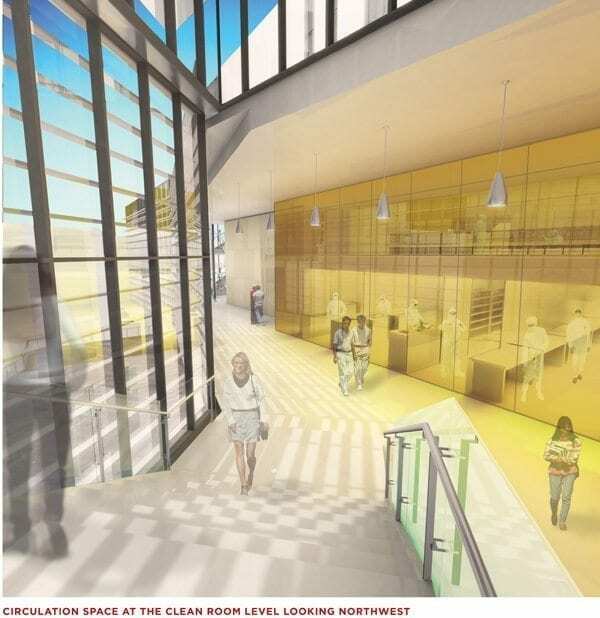 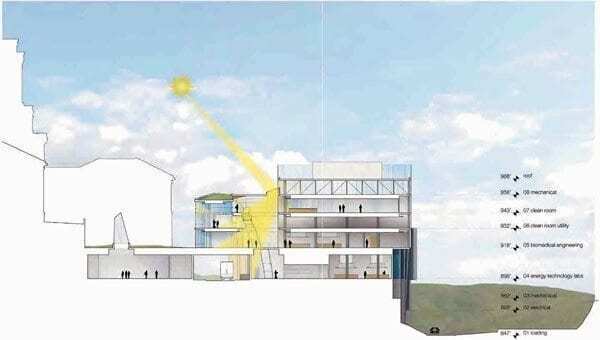 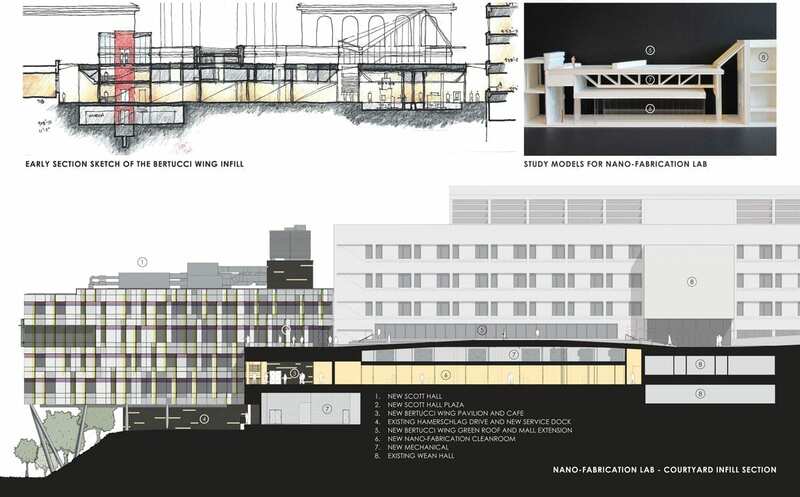 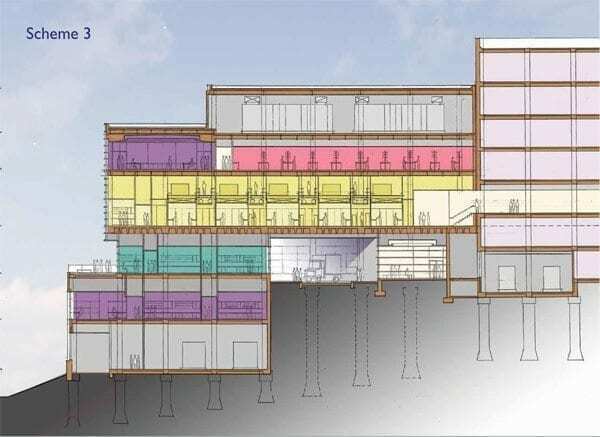 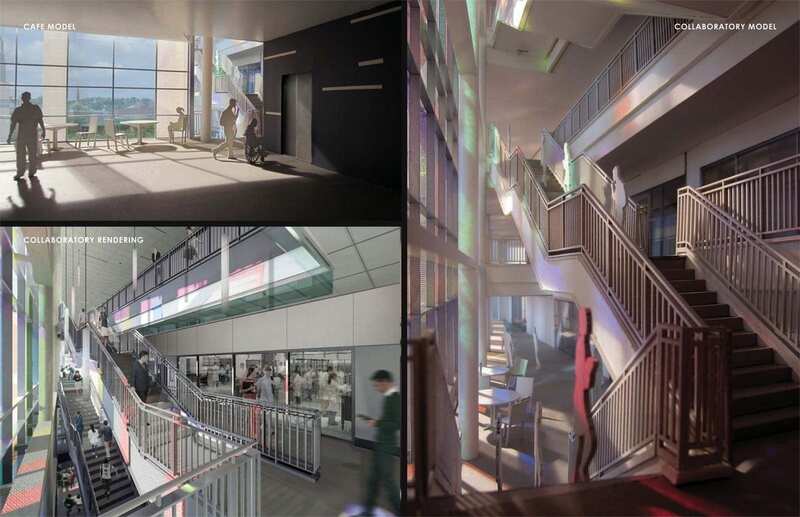 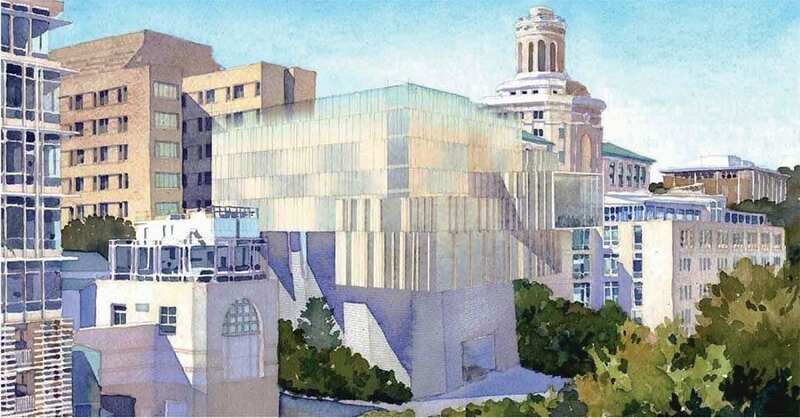 As they had anticipated, all of the other competitors submitted seven-story proposals that complied with the University’s original planning approach and located their ‘clean rooms’ in the towers. 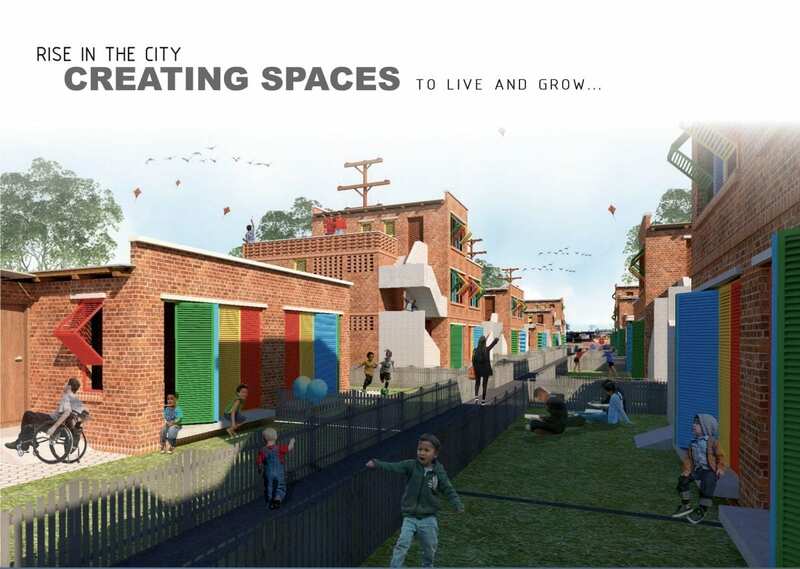 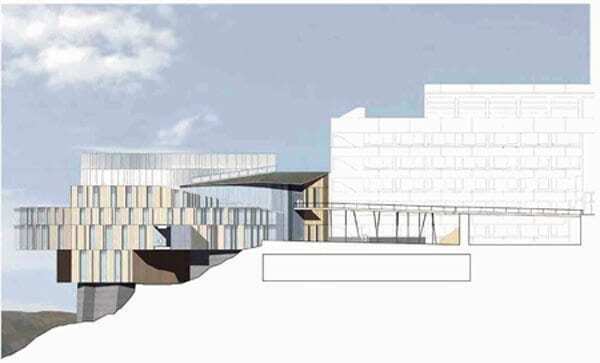 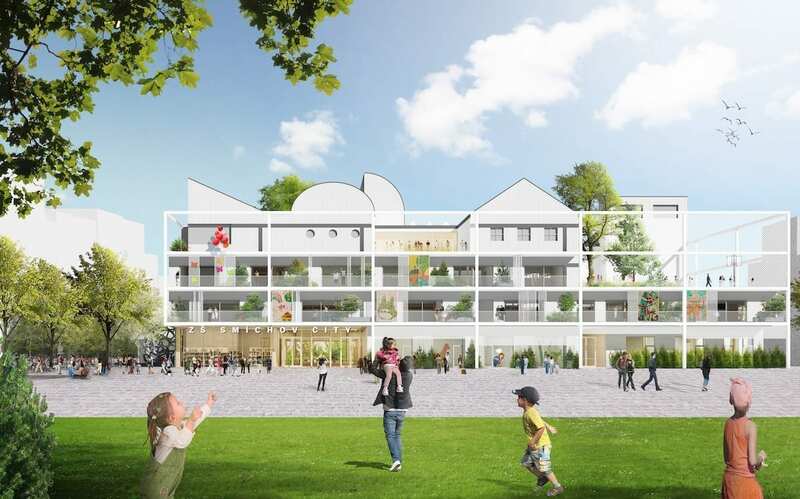 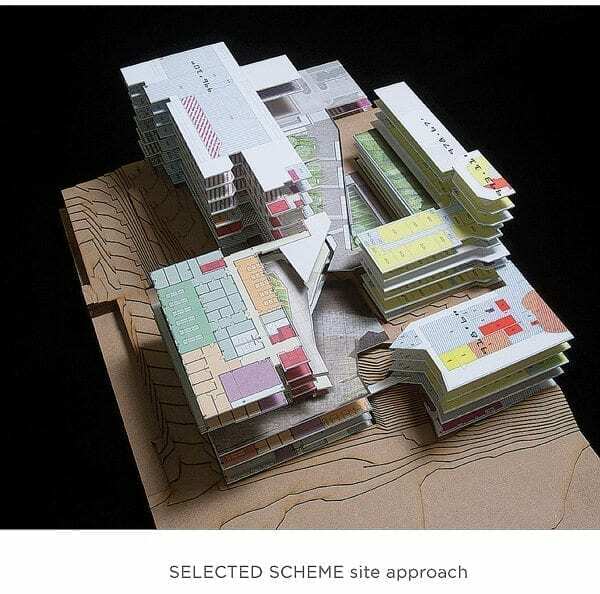 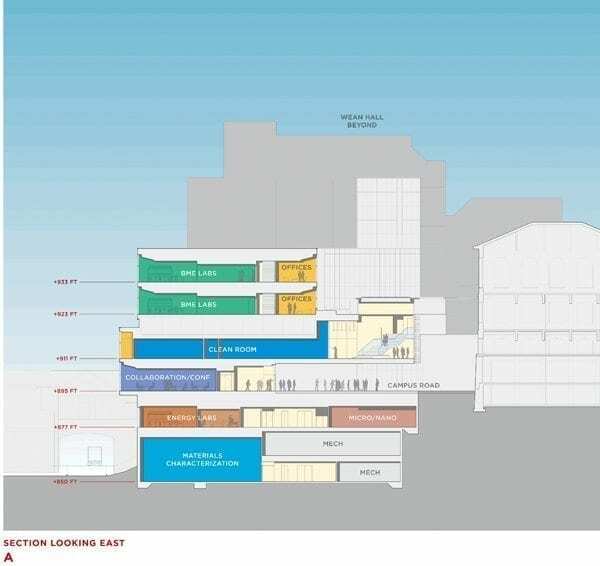 The plan by OFFICE 52 with the ‘infill’ had the added advantage of creating more green space and a more visually pleasing setting for Hamerschlag Hall and the west end of the Hornbostel Mall. 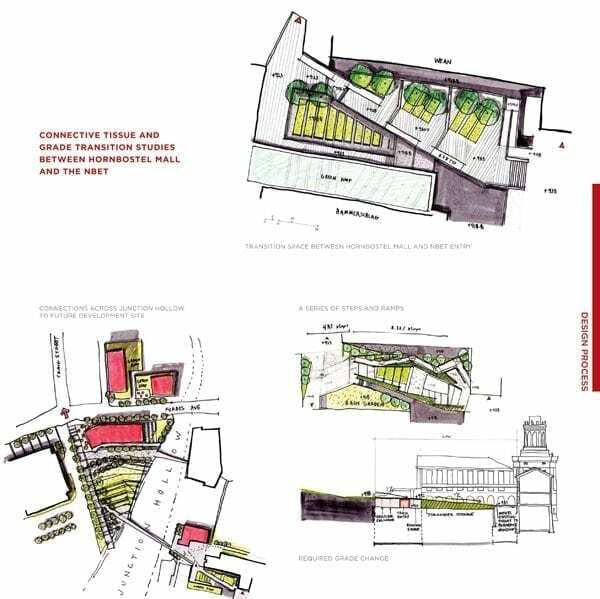 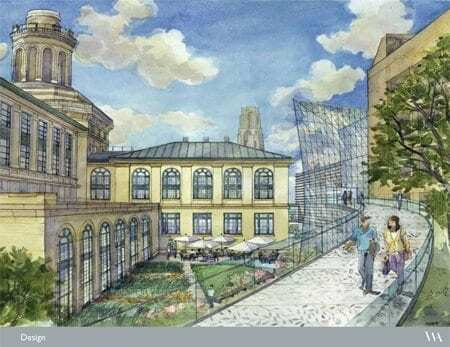 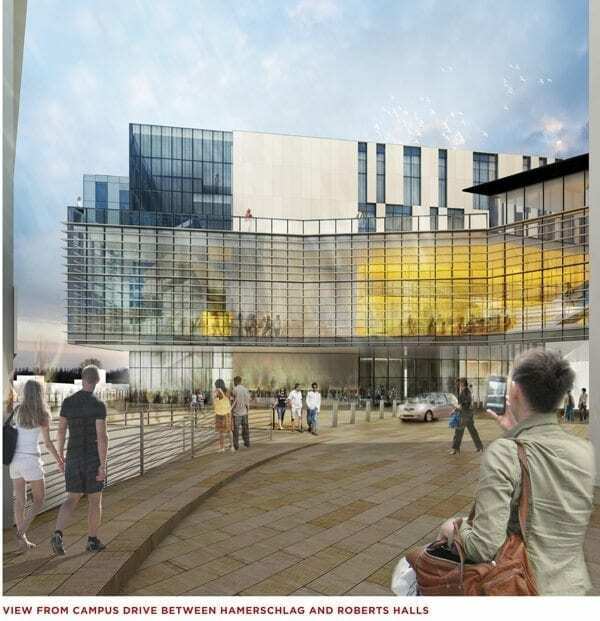 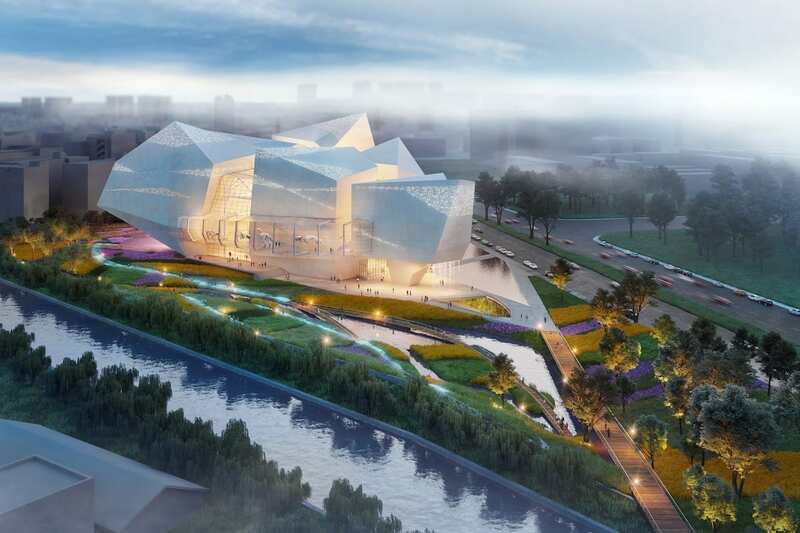 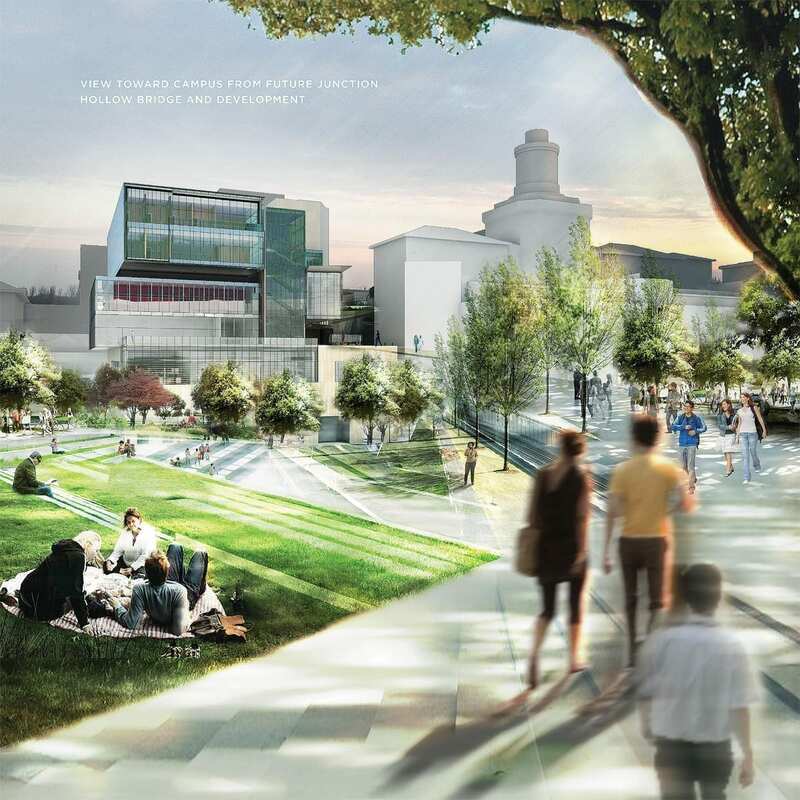 As a future option, they proposed a dramatic pedestrian bridge over Junction Hollow linking the Mall and Scott Hall to potential future development on the opposite side, adjacent to the Carnegie Museum of Art. 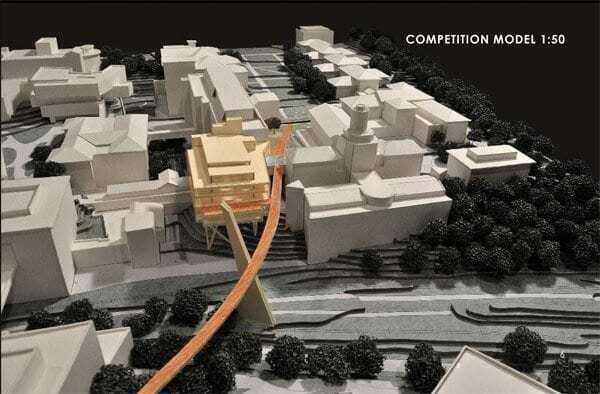 As is often the case with complicated projects, the realization of a competition proposal can require a lot of back and forth between the design team and the client; and here this was no exception. 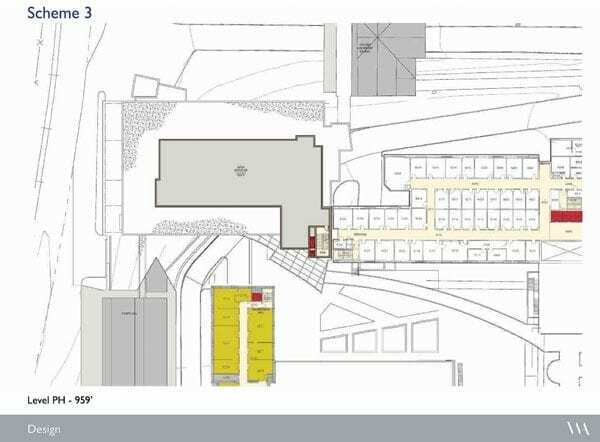 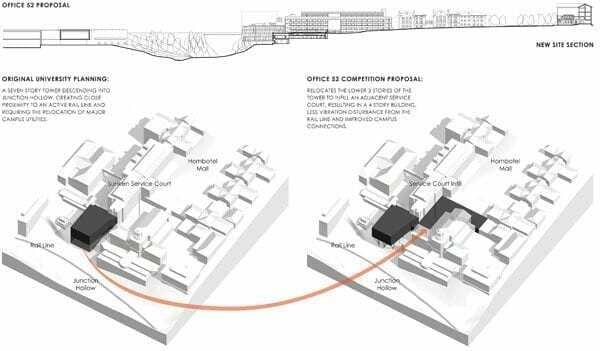 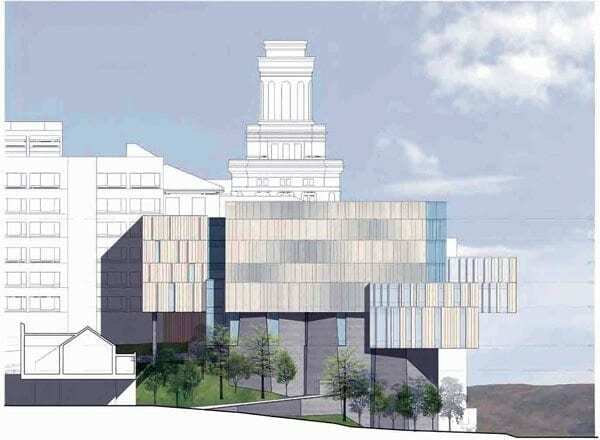 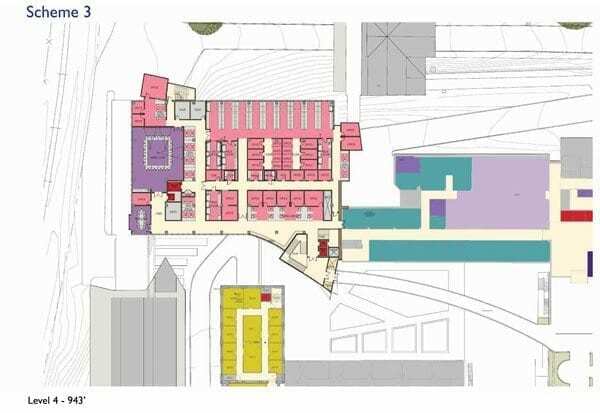 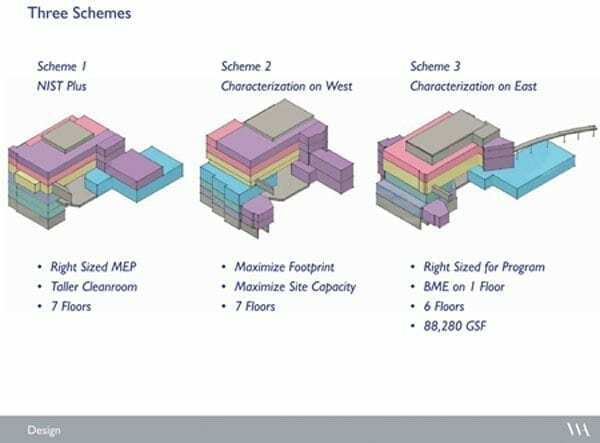 OFFICE 52’s competition proposal had shown the University that their site had more capacity than originally thought. 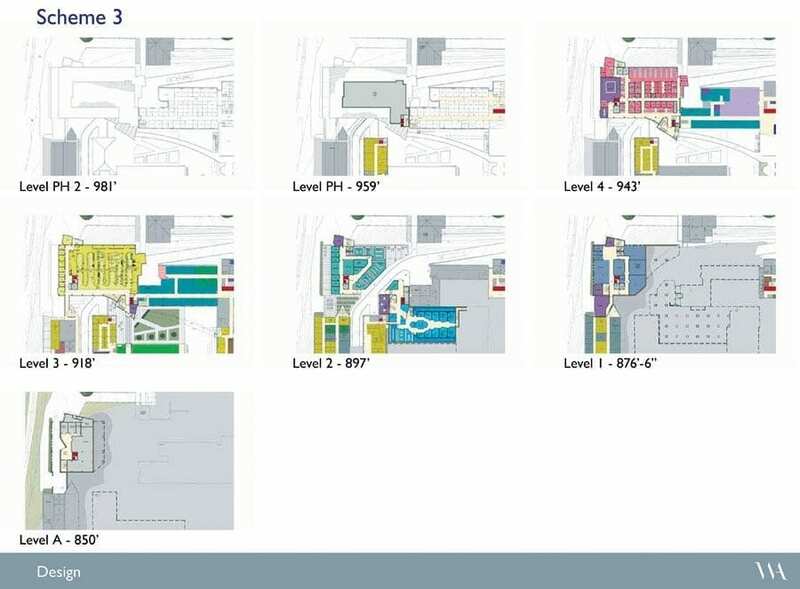 The final 109,000 SF building was the result of a long process in which the design team and the University weighed many different options for program, building size, phasing and cost. 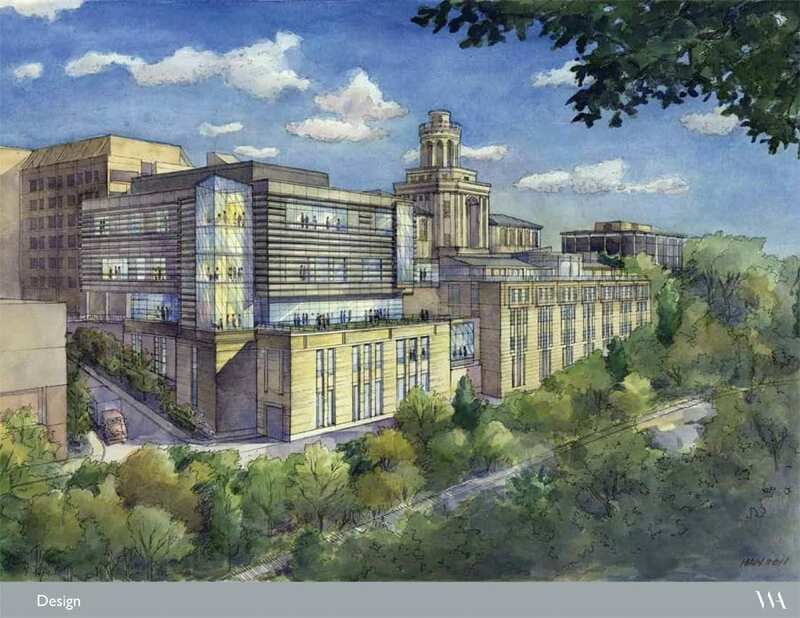 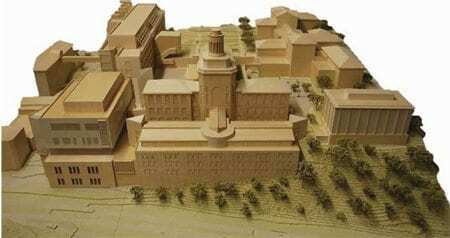 Ultimately, because of future expansion needs and future space challenges for any construction in the center of the campus, the University ultimately decided on a larger building than originally planned. 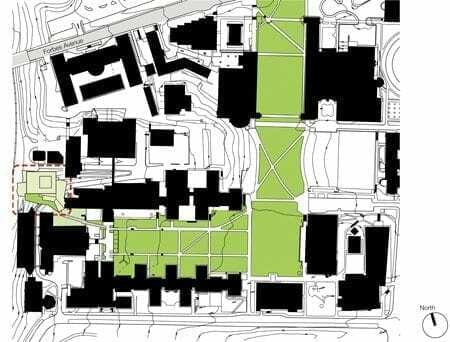 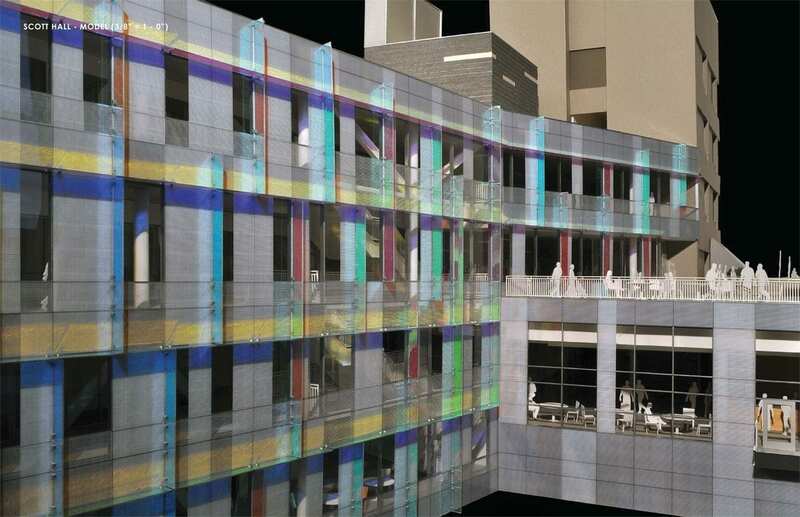 The final design for Scott Hall creates a new and vital hub for the College of Engineering, and quite literally knits together the site, open space, and the neighboring buildings. 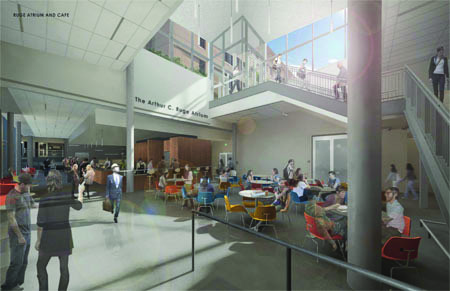 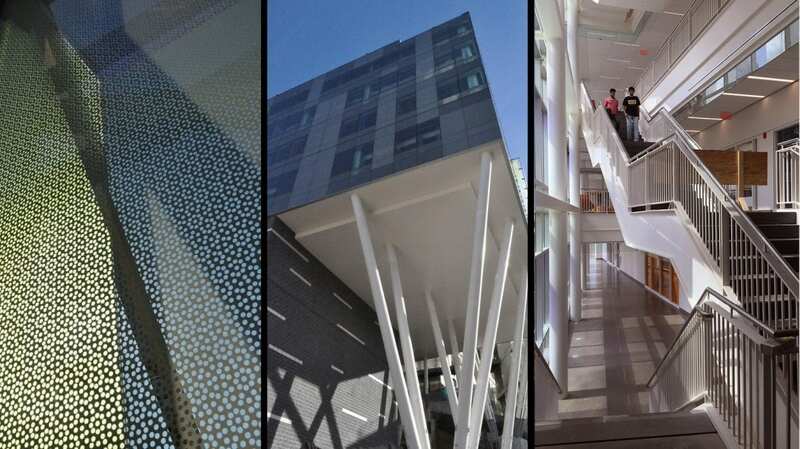 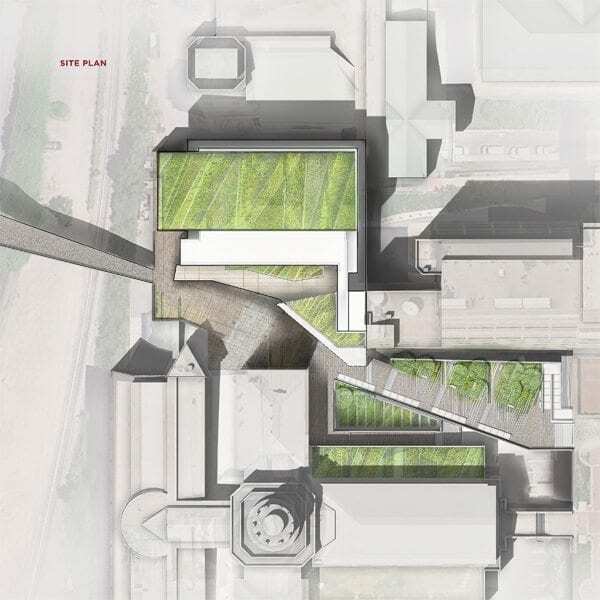 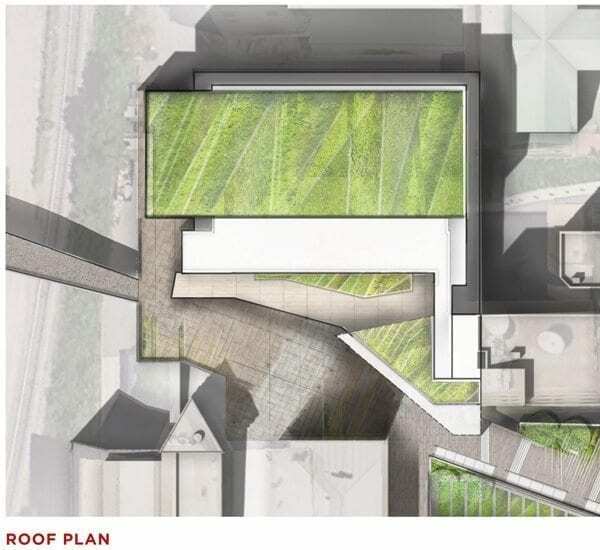 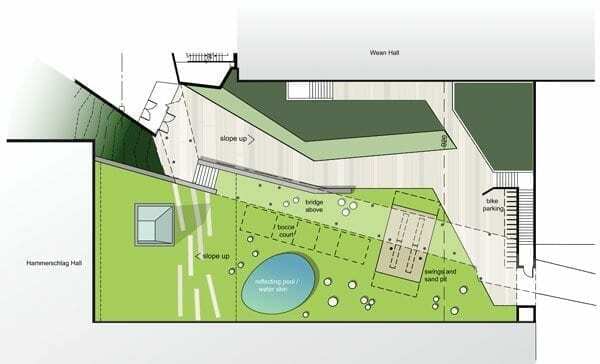 The design creates new pedestrian green space, new plazas, new building entries, and connects to four adjacent buildings on seven different floor levels. 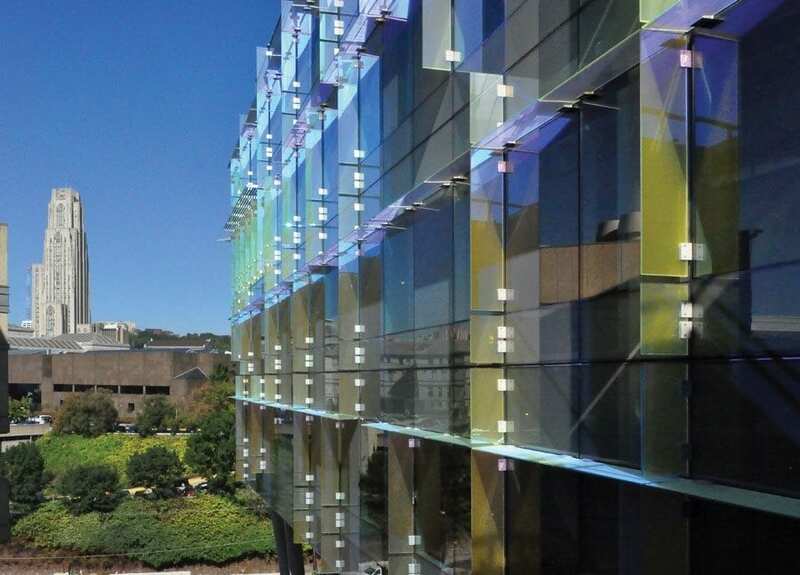 By their transformative infill solution, the OFFICE 52 team created not only a valuable addition to the campus fabric, it added value to its neighbors. 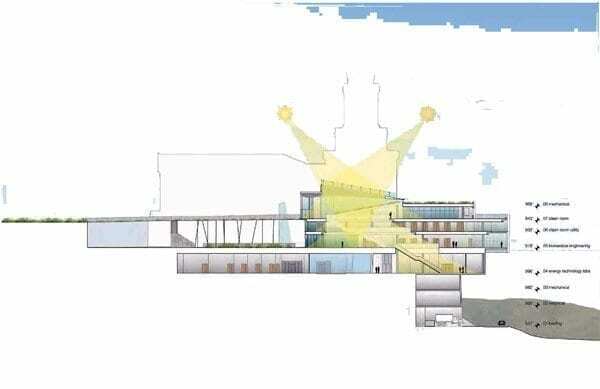 When the building is completely finished, those approaching the building from the top of the Mall will experience a sense of adventure. 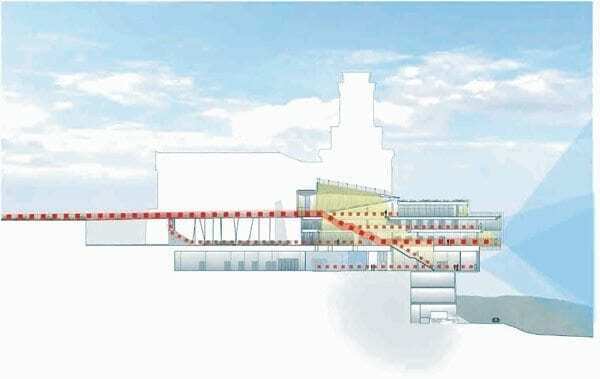 The building is partially hidden behind its neighbor and emerges as a welcome arrival feature with each approaching step. 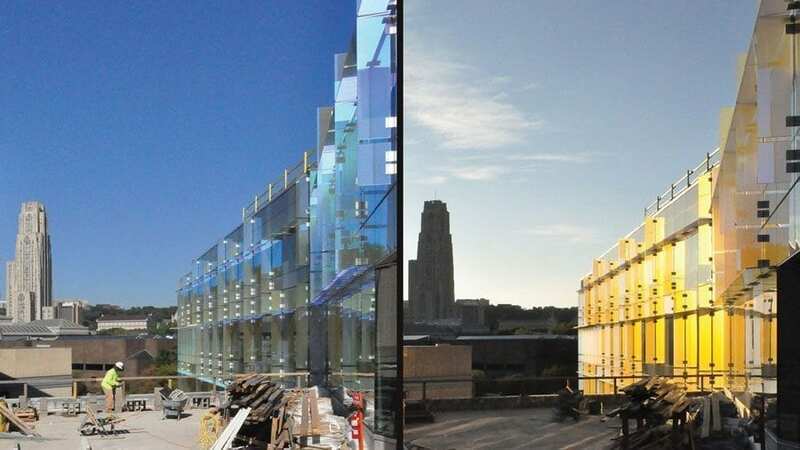 Not only can one appreciate the new plaza created by the infill, but also the building’s interesting exterior, a curtainwall complemented by dichroic glass sunshades, constantly reflecting change in appearance, patterns and shadows throughout the day and seasons. 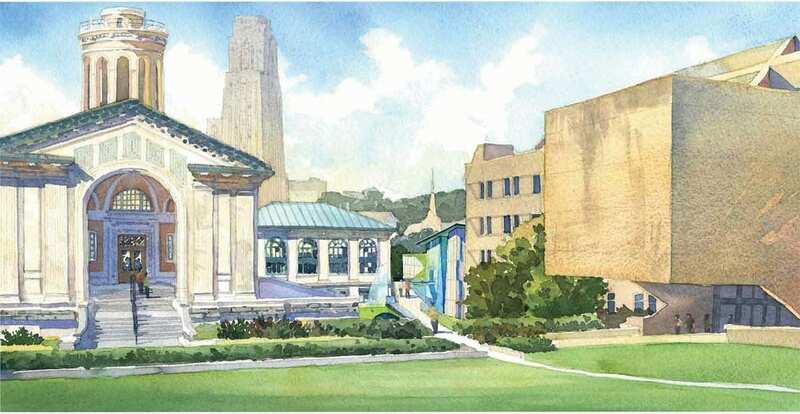 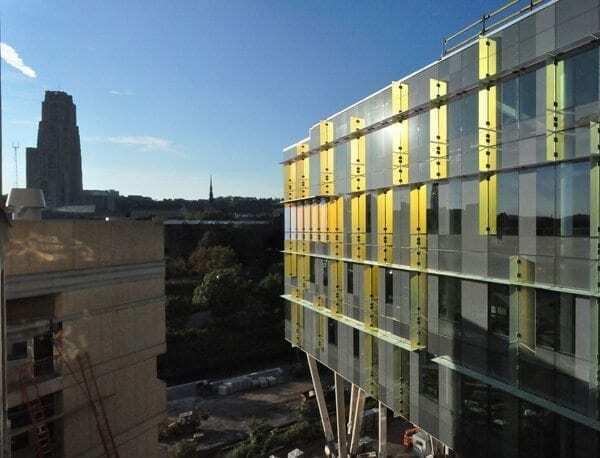 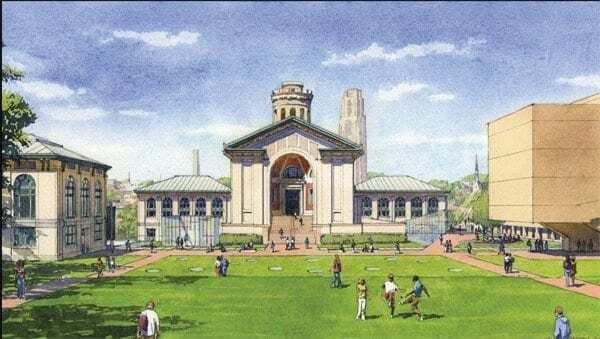 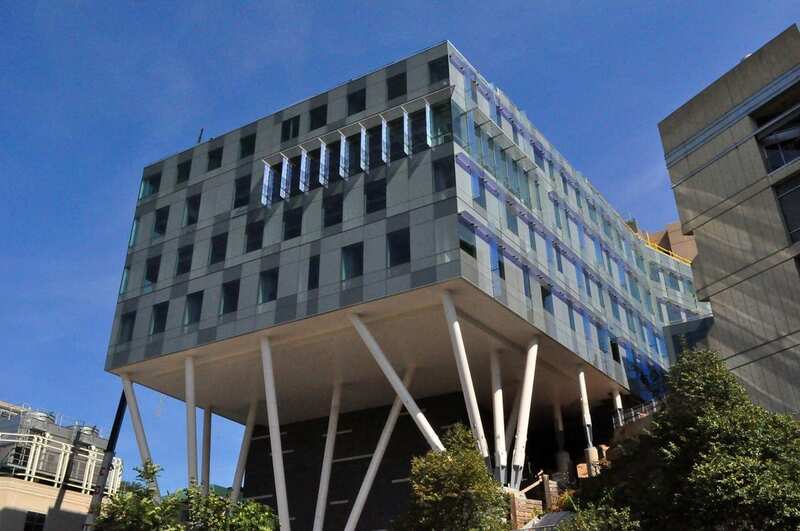 As if all this wasn’t enough, this rite of passage distinctly frames the University of Pittsburgh tower, as if that was the obvious intent of the architect. 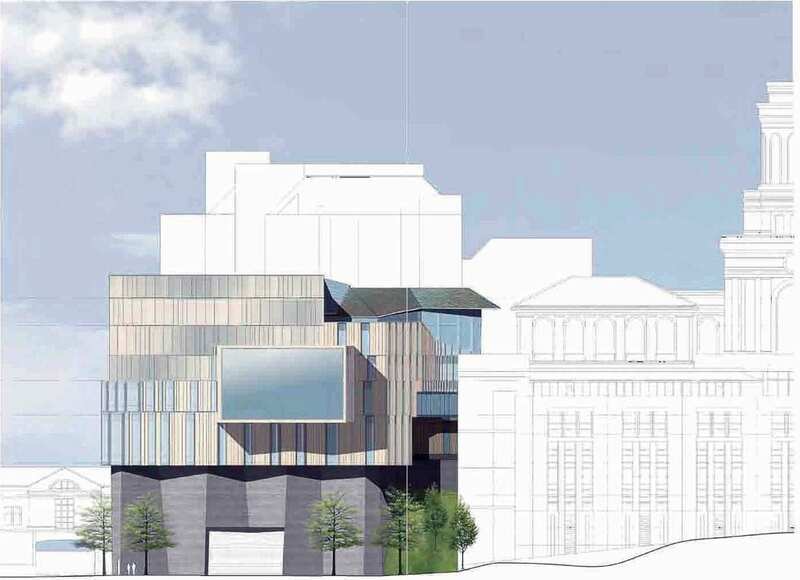 This was not just a simple, straightforward competition for a visually attractive structure, although that had to be a serious consideration. 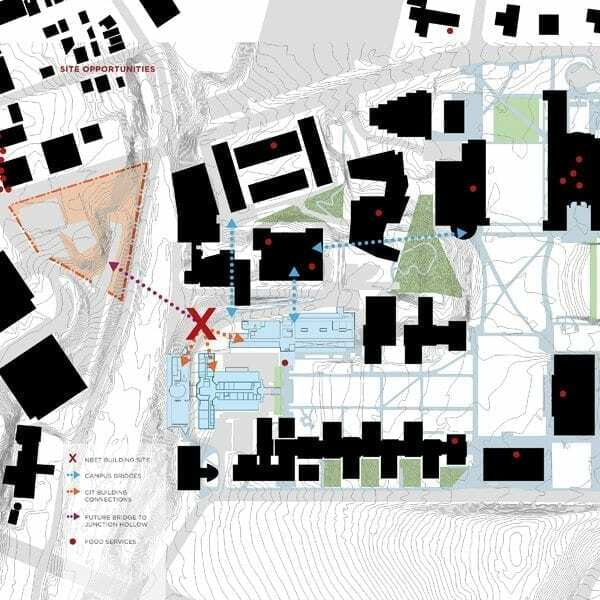 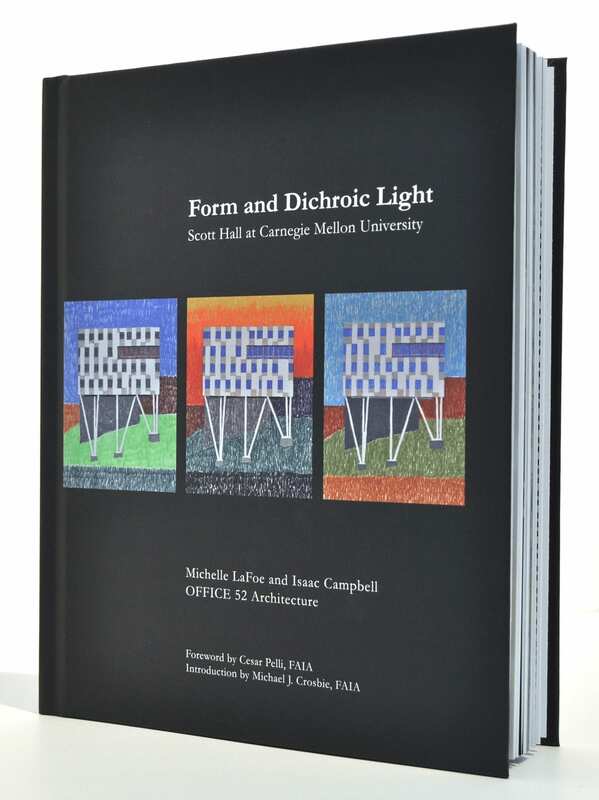 Here a client showed the flexibility and foresight to recognize how one firm’s unique approach to a design problem could also work to the long-term benefit of the university and its campus.